Should I have knee surgery for meniscus tear? Should I have meniscus surgery ? One of the most common calls our office receives involves patients who have had part or all of their meniscus removed and are now suffering with continued pain or arthritis as a consequence of the surgery. What is concerning to these patients is that their problems came upon them much more quickly than the doctor’s office suggestion that “eventually” they would develop osteoarthritis. “Eventually” for them came suddenly. If your question is, should I have a meniscus surgery? Then that question will be answered in this article. If you have been given the meniscus injury surgical recommendation, you have been told that you will get one of these three procedures. An Arthroscopic meniscus repair. In this procedure there is a small tear that suture can sew up. An Arthroscopic partial meniscectomy. In this procedure there is a piece of a meniscus that is more badly torn that stitches cannot help. This piece of the meniscus is recommended for removal because it cannot be repaired. An Arthroscopic total meniscectomy. The whole meniscus is considered damaged beyond repair and the entire meniscus will be recommended to removal. What happens when all or part of the meniscus is removed? As mentioned above, the patient will be told that eventually they will develop knee problems. The long-term side effects of meniscus surgery is that meniscectomies worsen knee joint instability by negatively influencing other supporting knee structures by increasing contact stress on the cartilage. The knee’s house of cards will crumble thereafter as increasing contact stress on the cartilage, increases the risk and occurrences of chronic knee inflammation and accelerates the degenerative knee conditions that lead to knee joint erosion or irreversible joint damage to the knee. This is the consequence of removing meniscus tissue. But why did these people have the surgery in the first place? Especially if they were told meniscus surgery could accelerate and cause irreversible knee damage? Partial meniscectomy for meniscus tears is one of the most common procedures performed by orthopaedic surgeons. For older patients or those more active patients with developing arthritis, the use of partial meniscectomy to manage degenerative meniscus tears and mechanical symptoms may be beneficial; however, its routine use in the degenerative knee over physical therapy alone is not supported. (Physical therapy is just as good as the surgery). In younger populations, partial meniscectomy may provide earlier return to play, and lower revision surgery rate compared with meniscal repair. Partial meniscectomy may result in earlier development of osteoarthritis. Younger patients get the meniscus partial removal surgery because they need to get back to work or back to the game quicker and surgery, despite its drawbacks, gets them there faster. Or o they believe, see the research below. Long-term development of osteaorthritis is seen as something that will happen “eventually,” not any time soon. It reports on how military surgeons dealt with meniscal injury. The report reveals findings on nearly 30,000 meniscus surgeries. In 81.3% of patients, a partial meniscectomy was performed. In 20.3% a meniscal repair was performed. 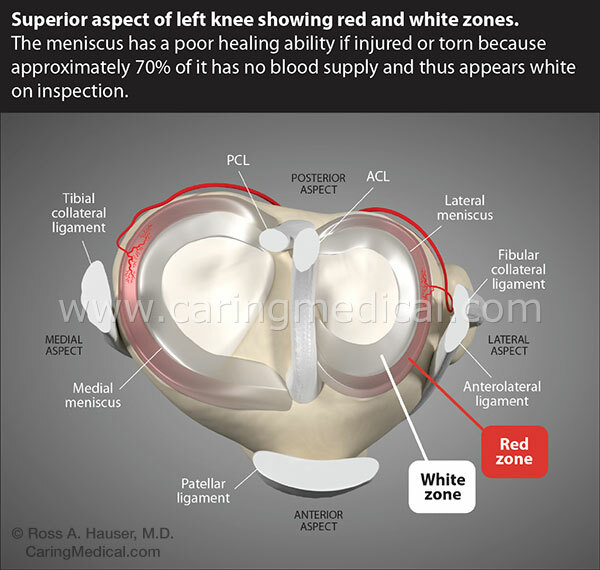 This is typically limited to the red-zone of the meniscus where ample blood supply allows for suturing and healing. Very rarely a meniscus allograft transplantation (cadaver donor) in 0.7% of patients was performed. Older patients were more likely to get a meniscectomy and less likely to get a repair. In 4 out of 5 patients, meniscus tissue had to be removed. In 1 out of 5 patients the injury was fixable because of location and size. Meniscus transplant has lost much of its appeal. The meniscus is hard to save. In the July/August 2018 edition of the medical journal Sports Health,(3) surgeons at UCLA talked about the younger patient and why taking out meniscus tissue is really not optimal. Basically, surgeons need to repair and save the meniscus. They also need to figure out how to do it. This research asks the same question we do, Why do we still perform meniscectomy? The French researchers acknowledge that even in late 2017, meniscectomy remains one of the most frequent orthopedic procedures, despite meniscal sparing techniques having been advocated for several decades now. Why do we ignore a mountain of clinical and scientific evidence against meniscectomy? The French team says the number of meniscectomy is excessive in the light of scientifically robust studies demonstrating the interest of meniscal repair or of non-operative treatment for traumatic tear and of non-operative treatment for degenerative meniscal lesions. Meniscectomy was long considered the treatment of choice. All but 1 of the 8 recent randomized studies reported non-superiority of arthroscopy over non-operative treatment, which should thus be the first-line choice, with arthroscopic meniscectomy reserved for cases of failure, or earlier in case of “considerable” mechanical symptoms. They like us agree, it is high time that the paradigm shifted, in favor of meniscal preservation. Doctors in Germany say that many of the studies critical of arthroscopic meniscus surgery are not 100% reflective of the patients they see. Medical research is broken up into levels of evidence. Level 1 being base evidence which means a researcher took existing research and combined it into a review of the literature. Doctors and researchers grade this the lowest level of accredited research. The German doctors say too much level 1 evidence is being offered as a generalization of meniscus surgery. The complaint is some surgeries will help some patients and that every meniscus surgery is not a bad surgery and this research is not reflective of that. They also cite that according to the consensus statement of ESSKA the European Society of Sports Traumatology, Knee Surgery and Arthroscopy, meniscus surgery is still recommended. So European surgeons have not yet embraced the idea of totally moving away from meniscectomy. The ESSKA guidelines also say the treatment of degenerative meniscal lesions should start with conservative management. In the case of persistent symptoms, surgery should be considered after 3 months. In the case of mechanical symptoms, arthroscopy might be indicated earlier. So there is a window of who the surgery can help. Unfortunately, this small window is usually left wide open to include patients who do not need the surgery. The other unfortunate thing is the constant and confusing term “conservative treatments.” Our idea of conservative treatments for meniscus tears is not the same as a surgeons view of what conservative care is. For us conservative care means regenerative medicine, for surgeons conservative care means treatments such as rest, ice, immobilization, anti-inflammatories, painkillers, Hyaluronic Acid Injections for knee osteoarthritis etc, treatments we already have dismissed as ineffective. This is discussed below. Doctors examine the incidence of total knee arthroplasty (total knee replacement) in patients who have undergone knee arthroscopy for partial meniscectomy, chondroplasty, or arthroscopic debridement of the knee. Obesity, depressive disorder, rheumatoid arthritis, diabetes, and being age 70 years and older were associated with increased relative risk of conversion to total knee replacement at 2 years. When obesity was combined individually with the top 5 other risk factors, no combination produced a higher relative risk than that of obesity alone. Patients who were 50 to 54 years of age had the lowest incidence of conversion to total knee replacement. Men had a lower incidence of conversion to total knee replacement (11.3%) than women (15.8%). The study’s doctors suggested that this information can help surgeons to counsel patients on the incidence of total knee replacement after knee arthroscopy and identify preoperative risk factors that increase risk. Doctors at New York University’s Langone Medical Center investigated the failure rate for surgically repaired bucket-handle meniscus tears at a minimum 2-year follow-up interval. Reporting in the medical journal the Physician and Sports Medicine in May 2017, the doctors looked at 51 patients who experienced bucket-handle meniscus tears that were isolated or occurred with an ACL injury. Meniscus surgery causes super accelerated knee arthritis. Do these findings present anything really new? No, research has been ongoing telling patients and doctors of the risks associated with arthroscopic meniscus repair. The summary of these studies? If you have a meniscus surgery, chances are you will be disappointed in the outcome and then move onto eventual knee replacement. In research appearing in the medical journal Clinical Anatomy, doctors issued their report on a phenomenon of super-accelerated osteoarthritis in knees with meniscus tear damage and history of surgical meniscus removal. In an early study researchers from the Department of Orthopaedic Surgery at Carolinas Medical Center found that a damaged meniscus is the active participant in the development of knee osteoarthritis. In the study above, the relationship to bone damage is discussed, in this cited study the Carolinas Medical team found a strong association between meniscus damage and cartilage loss. (12) The two combined studies help confirm missing meniscal tissue contributes to bone and cartilage degeneration. What is really remarkable is that researchers write paper after paper saying that removal of meniscal tissue in surgery causes advanced osteoarthritis and the procedures continue. Clearly, the best way to prevent cartilage breakdown and knee osteoarthritis caused by meniscal surgery is to AVOID the surgery. As reported in the New York Times August 3, 2016, arthroscopic knee surgery, especially meniscal tears, is a “useless” procedure. Nearly twenty years ago in the first edition of our book Prolo Your Pain Away – we told patients that if the surgeon removes the meniscus, arthritis is the end result. Further, since the meniscus aids in the stability of the knee, if removed the knee is left with too much motion and becomes unstable. This was the work of Finnish researchers who recognized that arthroscopic partial meniscectomy is one of the most common orthopedic procedures, yet rigorous evidence of its efficacy is lacking. So what they did was to conduct a multicenter, randomized, double-blind, sham-controlled trial in 146 patients 35 to 65 years of age who had knee symptoms consistent with a degenerative medial meniscus tear and no knee osteoarthritis. Patients were randomly assigned to arthroscopic partial meniscectomy or sham surgery. Then a scoring system was designed to measure pain, symptom severity, and knee pain after exercise at 12 months after the procedure. They specifically studied degenerative horizontal tears of the medial meniscus and hypothesized that surgical treatment would produce better outcomes than nonoperative strengthening exercises. This study was a randomized controlled trial with the highest level of evidence (level 1). The study had 102 patients with medial meniscus tears – 81 women and 21 men with the average age of 53.8. Fifty patients underwent arthroscopic meniscectomy while 52 participated in nonoperative strengthening exercises. The results did not match up the to researchers hypothesis. At the two year follow-up, there was no difference in pain relief, improved knee function or patient satisfaction. Results also showed that meniscectomy did not provide better functional improvement than the nonoperative group. But what was the difference between these two groups? One group of patients underwent invasive surgery, had tissue remove, and will likely experience long-term meniscus degeneration. In July 2017 doctors from medical universities in Finland combined their research to publish these findings on Arthroscopic partial meniscectomy in the Annals of the Rheumatic Diseases. (Our) results support the evolving consensus that degenerative meniscus tear represents an (early) sign of knee osteoarthritis, rather than a clinical entity on its own, and accordingly, caution should be exercised in referring patients with knee pain and suspicion of a degenerative meniscal tear to MRI examination or Arthroscopic partial meniscectomy, even after a failed attempt of conservative treatment. Why was the primary treatment for a meniscus tear a complete meniscectomy? Why was the primary treatment for a meniscal tear a complete meniscectomy, a surgery that removed the entire meniscus from the knee? 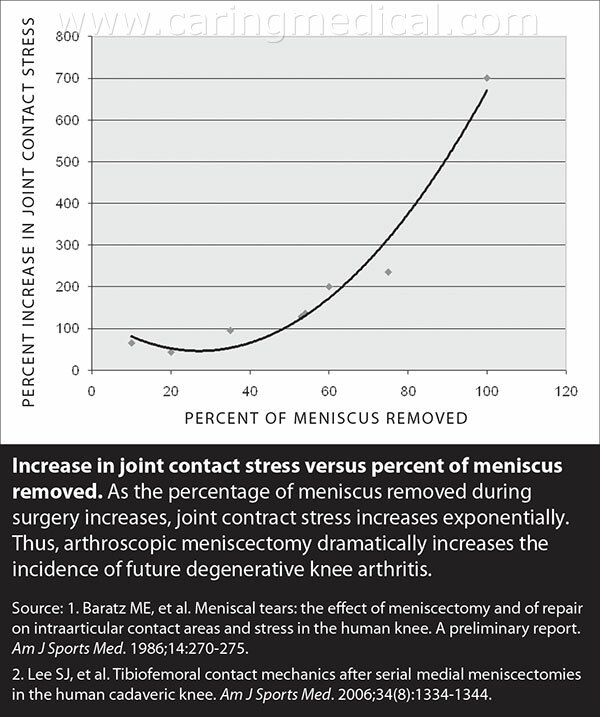 Why in the patient base that seemed the most likely to need a meniscus? A typical patient profile for this procedure was a younger, active, athletic patient who through their lifestyle accelerated knee overuse, and, the older patient who suffered from degenerative osteoarthritis. The goal of complete meniscectomy was to reduce pain, restore knee function, and prevent the development of osteoarthritis. As surgeons had long believed that the meniscus was a “remnant” tissue and that it was not needed, it could be removed if damaged without a negative effect. However, as medical research studied the long-term effects of this procedure, it became apparent in the medical community that complete meniscectomy was a primary cause of the sudden onset of knee osteoarthritis. The meniscus was, in fact, an important component of the knee. The meniscus provides several vital functions including mechanical support, localized pressure distribution, and lubrication to the knee joint. They are made of thick fibrous cartilage that allows it to function as a shock absorber between the upper and the lower leg bones. Even the American Academy of Orthopedic Surgeons was unable to come up with evidence to support the use of partial meniscectomy. The authors reported no significant treatment benefits of meniscectomy and at the 6 month follow up there was no difference noted between the two groups, “in terms of reduced knee pain, improved knee function and improved quality of life.” Not only was there no benefit, but it is important to note that surgical treatment for meniscal injuries can result in an acceleration of cartilage degeneration and an increased rate of osteoarthritis. The meniscus has a very difficult time healing its own injuries because of a lack of vascularization to the entire meniscus. That is the blood which carries healing elements do not reach all of the meniscus. Because of this, the meniscus is a composite of different types of cells, superficially, those that can heal, those that can’t. However, researchers at the University of Pennsylvania examining the meniscus’ complex mesh of fibers that run criss-cross to each other discovered that the two types of meniscus fibers, who jobs are to absorb knee impact, the circumferential fibers and the radial tie fibers have a unique understanding of maintaining knee integrity in the event of meniscus injury. They write: The meniscus is comprised of circumferentially aligned fibers (basically a mesh) that resist the tensile forces within the meniscus that develop during loading of the knee. Although these circumferential fibers are severed by radial meniscal tears, tibial contact stresses (the impact on the shin bone) do not increase until the tear reaches about 90% of the meniscus width, suggesting that the severed circumferential fibers still bear the load and maintain the mechanical functionality of the meniscus. Note: The meniscus can have a 90% tear and it will still figure out how to function. How it does this, is that the radial tie fibers, the perpendicular mesh network of the meniscus is helping to redistribute the knee load back to the severed but still functioning circumferential fibers. Note: What does all this mean? Is there recovery after an arthroscopic meniscus surgery? What is the recovery time after meniscus surgery? For many in regenerative medicine, this is a trick question because as the independent research cited in this article makes clear your meniscus will never recover and your knee will be made that much weaker. While these numbers sound reasonable they are not for the patients in the long-run. Non-surgical treatments such as comprehensive Prolotherapy typically and for a realistic expectation of treatment success are offered at about 6-week intervals and on average see results at the third treatment – anywhere from 12 – 18 weeks after first treatment. The difference is: While meniscus surgery can offer short-term goals the knee is in a downward spiral of joint instability to osteoarthritis to degenerative joint disease. In Comprehensive Prolotherapy, the knee joint instability is restored by repairing and regenerating tissue. Do you have a question about meniscus surgery or need help? 3 Mosich GM, Lieu V, Ebramzadeh E, Beck JJ. Operative Treatment of Isolated Meniscus Injuries in Adolescent Patients: A Meta-Analysis and Review. Sports health. 2018 Apr 1:1941738118768201.